Jamaica is not a country populated by alligators, which are known to be sometimes aggressive and potentially dangerous to people. The Jamaican Natural Resources Conservation Authority assures people that its country does not possess any alligators at all -- but it is home to one species of crocodile. Jamaica is totally without alligators, but tourist attractions like the one named “Alligator Hole” lend confusion to the issue. In fact, Jamaica only has one species of crocodile, the American crocodile (Crocodylus acutus), which is the smallest and the least aggressive. However, these crocodiles can get large and have been known to attack people. One famous crocodile, “Lester,” was 14 feet long when he killed a woman in 1999. He was then killed himself. 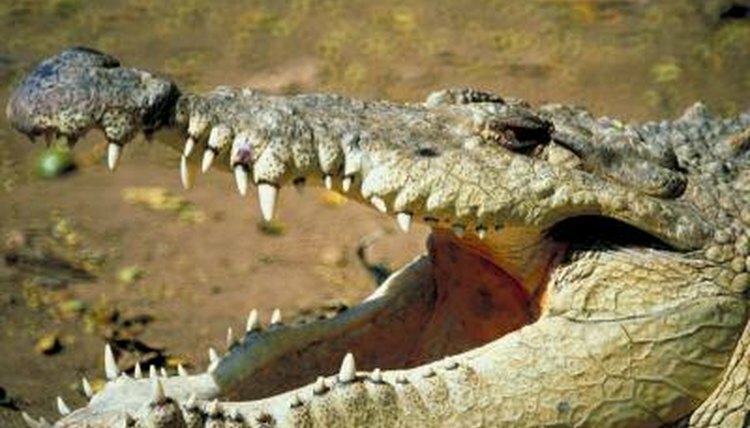 The American crocodile is far less aggressive than cousins in Africa and Australia that are sometimes highly antagonistic. The American crocodile is much more shy and tends to avoid people at all costs. Males get to between 8 and 12 feet normally, though specimens as long as 18 have been reported in Jamaica. They are also found in Florida, Cuba and Hispaniola. The idea that alligators exist in Jamaica or other parts of the Caribbean may be attributable to early reports by naturalists in previous centuries, or by a poor understanding of the differences between the two animals. For one thing, alligators stick to freshwater, while crocodiles may exist in salty environments. For another, crocodile snouts are long and pointy, ending a V-shaped point. Alligators, on the other hand, have blunt and rounded snouts with a protruding end. Alligator teeth are visible when their mouths are closed; crocodile teeth are not. Despite the fact that there are technically no alligators in Jamaica, that does not stop tourists from heading there to get a gander at the fierce animals. Alligator Hole, a mangrove-forested wetland that leads into the ocean, is a popular attraction. People go there to see herds of manatees or sea cows who live there. While the large reptiles from which the place gets its name are often referred to as alligators, they are crocodiles. Animal Planet: What's the Difference Between an Alligator and a Crocodile? How Does an Alligator Communicate?